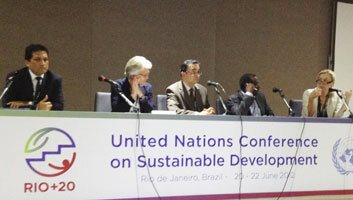 The United Nations Conference on Sustainable Development (Rio +20) was held from 20 to 22 June at the Riocentro Convention Center, Rio de Janeiro, Brazil. 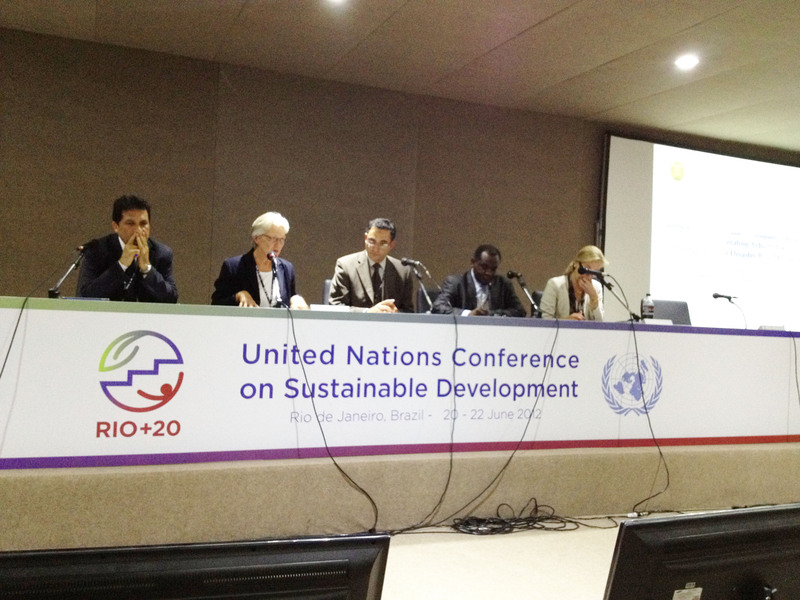 At the Rio+20 Conference, world leaders, along with thousands of participants from governments, the private sector, NGOs and other groups, came together to shape how to reduce poverty, advance social equity and ensure environmental protection on an ever more crowded planet to get to the future we want. Before and during the main conference, a number of side events sponsored by Governments, Major Groups, UN system and other Inter-Governmental Organizations are organized on the seven critical topics on the agenda of the conference. 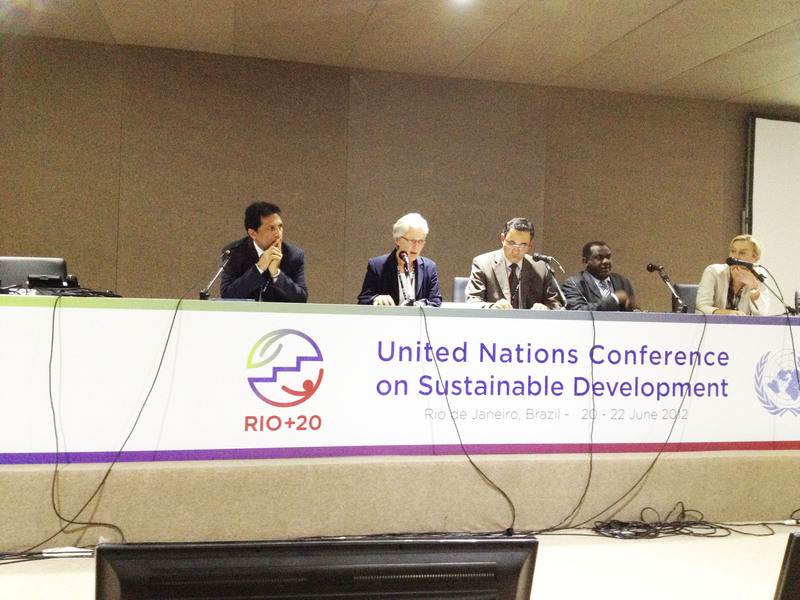 In order to contribute to the global efforts towards sustainable development, SESRIC organized, in cooperation with the Islamic Development Bank (IDB), a side event during the Conference at RioCentro Convention Centre on 19 June 2012, entitled as 'Building Resilience for Sustainable Development in the OIC Member Countries: Accelerating Actions for Comprehensive Disaster Risk Management'. The side event focused on one of the seven critical topics on the agenda of the Rio Conference - Disasters - with the aim of generating higher level of awareness among policy makers and experts in the OIC member countries with regard to the need for a comprehensive disaster risk management strategy as an integral part of their overall national development strategy. 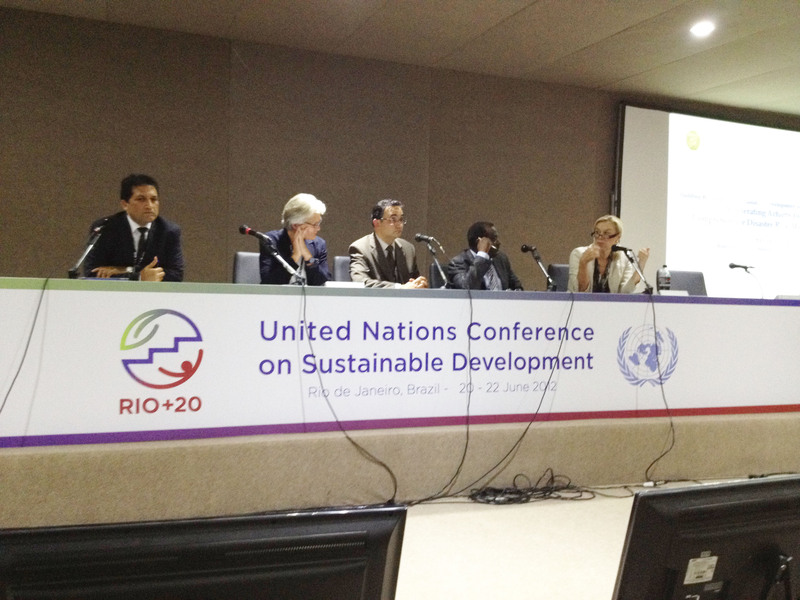 Given the fact that the majority of the population in the 57 member countries is extensively prone to natural and man-made disasters due to extensive exposure to natural hazards and other vulnerabilities, this event aimed at mobilizing actions on the part of OIC member countries, and initiating the necessary exchange of knowledge and best practices to improve upon existing national capacities for building resilience to natural disasters. 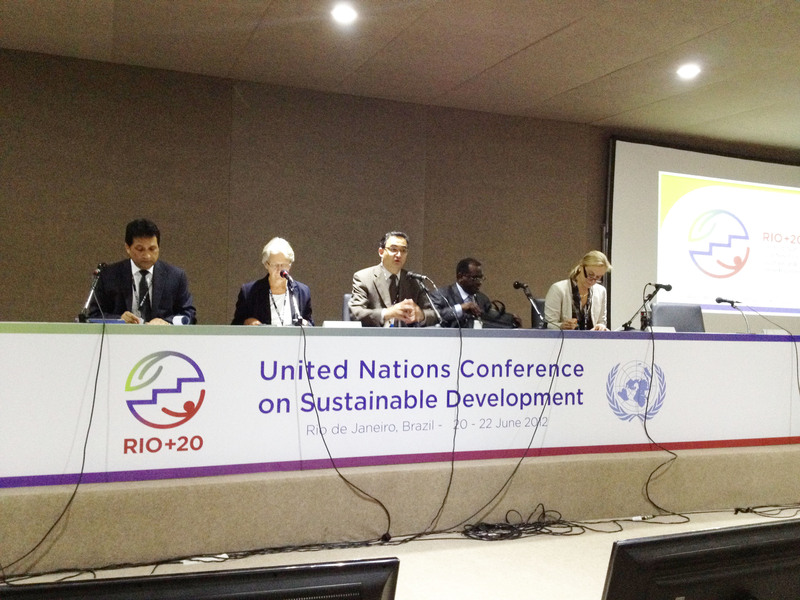 The side event took place at 11:30-13:00 in room T-3 at RioCentro Convention Centre. Dr. Savas Alpay, Director General of SESRIC, chaired the event. At the outset, Dr. Alpay highlighted the importance of disaster risk management in OIC countries by emphasizing the fact that OIC countries are significantly exposed to hazards and various vulnerabilities that exacerbate the impacts of hazards. After his welcome speech and opening remarks, the representative of IDB, Dr. Azhari G. Ahmed, Lead Economist, welcomed the participants on behalf of the Islamic Development Bank. Following the opening remarks, Dr. Kenan Bagci, Researcher at SESRIC, made a presentation on natural and man-made disasters in OIC countries and, based on the available statistics, stressed the need for immediate action for comprehensive disaster risk management in the member countries. 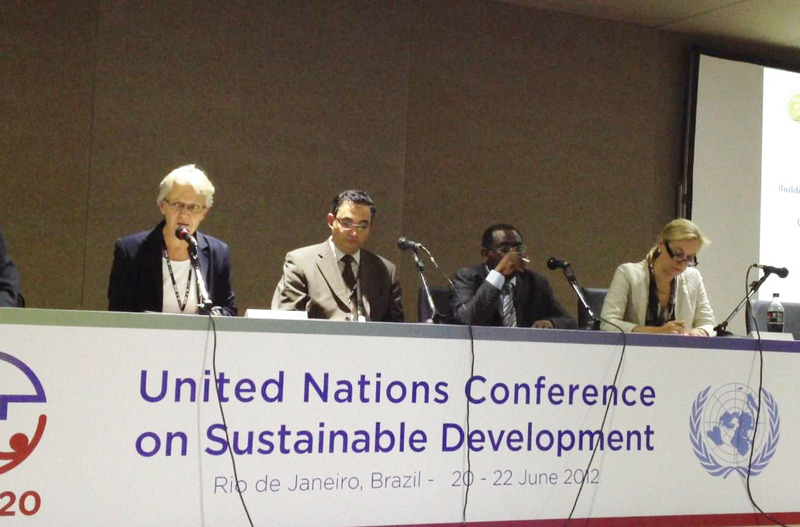 The side event hosted two main distinguished panellists, Ms. Margarita Wahlström, the Special Representative of Secretary General at UNISDR and, Ms. Sigrid Kaag, the Assistant Secretary-General and Assistant Administrator, Bureau of External Relations and Advocacy at UNDP. In their presentations, they mainly focused on socio-economic vulnerabilities in the formation of natural and man-made disasters and strategies for reducing such vulnerabilities. As the first key panellists of the session, Ms. Margarita Wahlström stressed the relationship between the level of development and vulnerabilities and importance of education and health improvement in this context. She highlighted that exposure increases with economic development, as rapidly growing economies accumulate exposure fastest. Her discussion continued with main drivers of disaster risks, which includes climate variability, urbanization and sophisticated societies. While urbanization has an impact on agricultural production, sophisticated societies make it difficult to talk about generalities. Costs of disasters and major challenges in dealing with different types of disasters were the other issues that are pointed out by Ms. Wahlström. She also called attention to the fact that in many countries disaster risk management is regarded as a disaster response issue only. In this regard, the need for strong cooperation among the related institutions in each country is recommended for effective disaster risk management, which includes not only response but also prevention, preparedness, and recovery. The other key panellist, Ms. Sigrid Kaag made a presentation with a focus on promoting disaster resilience through preparedness, risk reduction and recovery. She highlighted the importance of interface between natural and man-made disasters and building resilience for sustainable development. She also stated that disasters allow turning crises into opportunities provided there is strong leadership, vision and support of international communities. There is need for long-term strategies, comprehensive but prioritized, to increase the resilience. Bringing together the humanitarian efforts in post-disaster response, enhancing social protection systems, reducing poverty, improving governance, preventing conflicts, strengthening institutions are among the other highlights of the speech that are deemed to be important in dealing with disaster management. Both UNISDR and UNDP provided some information on their programmes and activities in the area of disaster risk management and declared once again their readiness to cooperate further with OIC countries and institutions for effective disaster risk management. Lastly, Dr. Faiq Billal, Director of Science Dept. in ISESCO, made a presentation on the actions taken by OIC countries on disaster risk management. 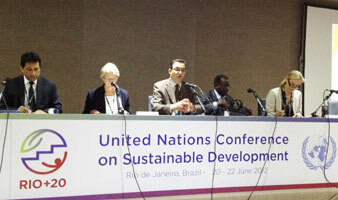 The side event ended with Q&A session. Consequently, the side event organized by SESRIC and IDB provided an opportunity to intensify the efforts to consolidate partnership with the various international, governmental, and non-governmental organizations as well as the private sector organizations, development agencies, and community based groups. The event is, therefore, expected to contribute to efforts in devising an effective and comprehensive disaster risk management strategy for 57 OIC member countries.